The last part of the report of the traditional Q&A session, which closes the Cosmetic Valley Perfumes and Cosmetics Congress every year. 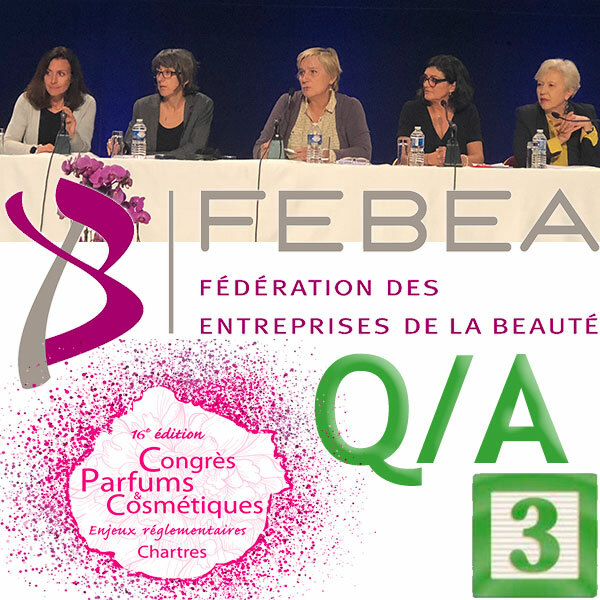 The FEBEA’s scientific, regulatory, environmental and international affairs experts answered the congress participants’ questions regarding the cosmetic product safety assessment, but also concerns raised by Brexit and international issues such as the Nagoya Protocol or export blockages. It has been requested by the ANSM that toxicological experts extrapolate tolerance tests to the target population if the test has not been done on the right population. However, some experts consider that it is not up to them to do so. What then to do? It depends on the target population in question and the tests performed. Ideally, if you really have a very special target population (we can take the example of babies), it is better to ask the safety assessor what type of test he needs and on what type of population to validate the target. There are many products for target populations, for example a face cream for a baby, for which extrapolation does not seem very complicated if the test was done on sensitive skin.